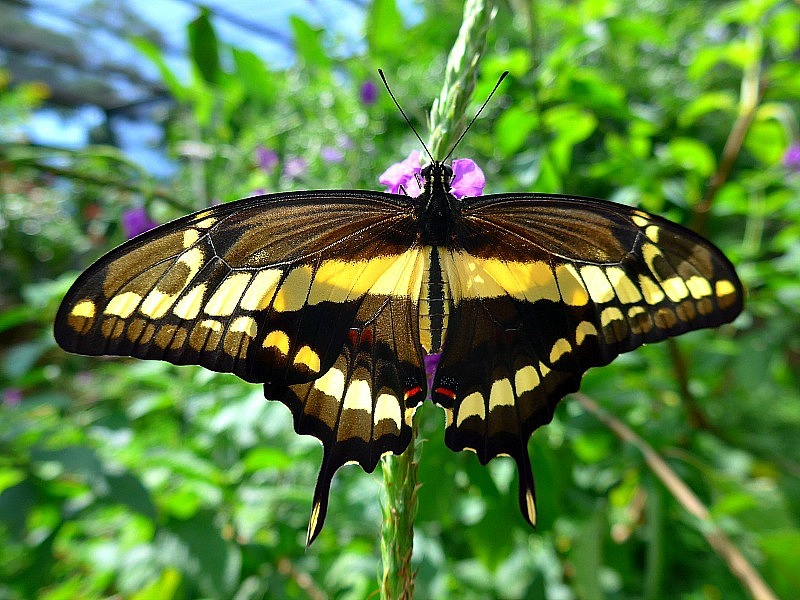 What does a butterfly have to do with serving in the U.S. Peace Corps? 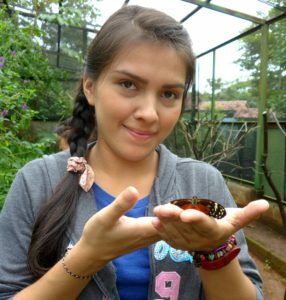 As a Peace Corps Response volunteer from July 2014 to March 2015, I had the opportunity to raise thousands of butterflies for an exhibit in El Salvador. A Giant Swallowtail (Papilio cresphontes) butterfly nectars on Porterweed (Stachytarpheta jamaicensis) in El Salvador. El Salvador is still recuperating from a devastating civil war that wracked the country from 1980 to 1992, leaving at least 75,000 people dead and tens of thousands more displaced. My site, Segundo Montes, is a community made up of five towns in the eastern department of Morazán, formed in 1990 by repatriated refugees who fled the country’s civil war. 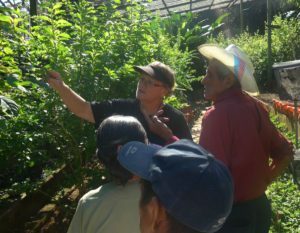 Suzanne Tilton demonstrates the importance of butterfly host plants in the Mariposario Turístico Almirante de Morazán, a large butterfly enclosure in El Salvador. After nearly a decade in refugee camps in Honduras, residents returned en masse 25 years ago to reclaim their livelihoods and dignity. I wanted to help this once-war-torn community’s iconography transform itself from memories of combat fatigues to fluttery symbols of peace and hope. When I arrived at the Mariposario Turístico Almirante de Morazán, I was thrilled to see the abundance and variety of butterflies – from Blue Morphos (Morpho peleides) to Zebra Longwings (Heliconius charithonia) and everything in between – flying in the gardens outside. It was a delightful sight and I knew immediately that I had arrived where I belonged. The butterfly exhibit was built in 2008 as an agricultural project to raise butterflies but, within two years, it was abandoned due to lack of knowledge and support on how to raise and manage the rearing of butterflies. My job as an Educational Butterfly Farm Management Specialist was to train butterfly wranglers how to cultivate butterflies and maintain a healthy habitat for them inside the exhibit. A delightful child visiting the butterfly zoo has dressed up as a butterfly. I also visited several primary and secondary schools to teach the life cycle of butterflies and why they’re important for the mountainous environment. Children had the chance to hold and observe up close live specimens in the forms of eggs, caterpillars, chrysalises and adult butterflies. I used props to dress up the children as caterpillars, butterflies and moths. They cheered in delight when we released butterflies at the end of the presentation and watched them fly freely into the sky. I knew I was having an impact when parents would stop me in the community and share that they had learned all about butterfly metamorphosis from their children. One of the highlights of my experience in El Salvador was a weekend visit by 50 students from the University of San Carlos in Guatemala City, who came across the border to learn butterfly biology and butterfly zoo management with an emphasis on environmentally friendly sustainability. There is a concerted effort to develop tourism along the Ruta de Paz (Peace Highway) from Morazán’s capital of San Francisco Gotera to El Salvador’s border with Honduras, along Highway 7. The butterfly zoo is strategically located along this route and is well positioned to attract the attention of vacationers headed to the cool air and brilliant sunshine of Perquín, eight miles farther north. 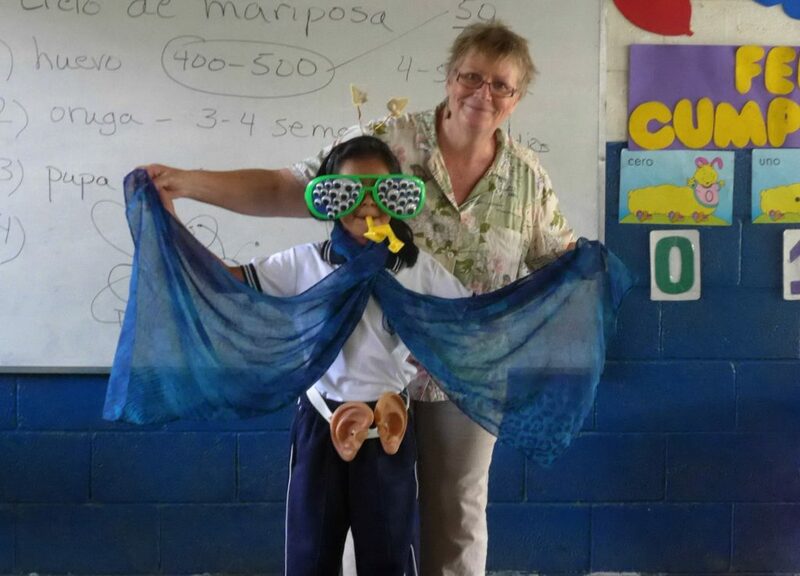 Teaching a class on butterfly biology in El Salvador. At 4,000 feet in elevation, Perquín is a popular destination of Salvadorans fleeing the heat and humidity of the coast and tropical lowlands. As time goes by, it is hoped that the Mariposario Turístico Almirante de Morazán will play its part in entertaining and educating tourists on the beauty of butterflies while it continues to contribute to the economic well-being of the community. A visitor to the butterfly zoo experiences the joy of holding a Tiger Longwing (Heliconius hecale). In conjunction with the nascent tourism industry, I was privileged to make presentations and conduct field trips for university students studying tourism and hospitality at the nearby Technical Institute of Father Segundo Montes. I experienced such a feeling of joy and satisfaction as I watched mesmerized visitors hold a butterfly for the first time. Just as a caterpillar transforms into a butterfly, I have been transformed into a different person by serving as a Peace Corps Response volunteer. Learning about the different parts of a butterfly; including compound eyes, hearing sensors, proboscis and wings. Suzanne Tilton retired from teaching, mostly primary grades, after 28 years of service in 2010. She has raised butterflies for over 20 years and has shared the wonder of butterfly biology with thousands of children and adults. 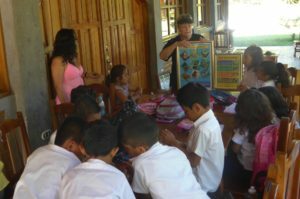 Suzanne and her recently retired husband, David, were so impressed with Peace Corps in El Salvador that they have applied for and been invited to teach English in the South Pacific Kingdom of Tonga for 27 months starting in August 2015. Editor’s Note: This post was written and originally published in Peace Corps Passport, the U.S. Peace Corps’ official blog, on 22 April 2015 to commemorate Earth Day. 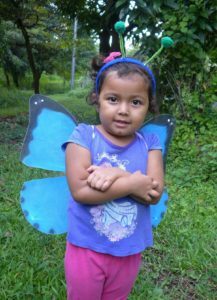 Suzanne and her husband, David, eventually chose not to serve in Peace Corps, but did move to Tonga in October 2015, from where they continue to research, publish and teach worldwide about the wonder and joy of butterflies.